For classical music lovers it doesn’t get much better than the BBC Promenade Concerts, better known as The Proms. A British national treasure for the past 120 years, the world’s greatest festival of classical music roars into London’s Royal Albert Hall mid-July, setting off 92 concerts and two months of non-stop musical feasting and culminating in that beloved tradition known as the Last Night of the Proms. The original Proms’ promise, to create a joyous celebration of music and reach the widest possible audience, means there are plenty of affordable seats, with half price for under 18s and 1300 ‘promming’ (standing) tickets for every Prom at a bargain £5. Every Prom season gets bigger, better and more imaginative. This year sees a gobsmacking choice of 46 orchestras, 53 conductors, 16 visiting ensembles, soloists, choirs and other performers from around the world and 32 premieres. There are adventurous Late Nights, Sunday Matinees to introduce audiences young and old to classical music, and 75 free ‘Extras’ like talks, family workshops and special events. Amongst many Prom treats are a Sherlock Holmes Prom, Asian and Bollywood Night, Life Story Prom with naturalist Sir David Attenborough, a Story of Swing evening and a full staging of the musical Fiddler on the Roof, with Welsh wonder Bryn Terfel re-invented as the impoverished but cheerful shtetl milkman. The Proms love anniversaries and this year will celebrate Stephen Sondheim at 85, Frank Sinatra at 100, and composer Jean Sibelius at 150. Percussionist extraordinaire Dame Evelyn Glennie, best known for her moving performance at the 2012 Olympics Opening Ceremony, marks her own 50th birthday with a musical party. The Last Night of the Proms will be led by charismatic American conductor Marin Alsop, who so captivated British audiences two years ago when she became the first woman to conduct the Last Night. Last Night celebrations, complete with traditional fancy dress, party poppers, balloons and flag-waving singalongs to ‘Rule Britannia’ and ‘Land of Hope and Glory’, are always sold out many times over. That’s where Proms in the Park come in, created in 1996 so that the overwhelming numbers of final night fans won’t miss out on the fun. Now, in addition to the indoor Royal Albert Hall finale, audiences can choose from four open air spectacles around the UK. Impressive concerts in Belfast, Glasgow, Swansea and London’s Hyde Park bring the four UK nations together in song and spirit with the help of endlessly enthusiastic compere Sir Terry Wogan and live big screen linkups. Hyde Park’s stellar headliners this year will be The Jacksons— founding members Jackie, Tito, Germain and Marlon— in tribute to little brother Michael. 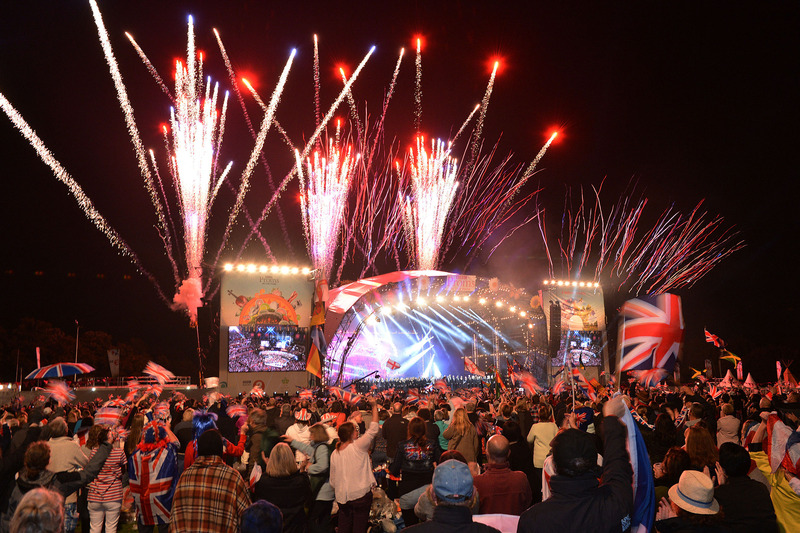 They will be joined by The Mavericks, trumpeteress Alison Balsom, celebrities, choirs and fireworks for the grand cross-country finale, as Prommers across the land sing, wave Union Jacks, pop poppers and let go all that British reserve. But don’t worry if you can’t make it to the Last Night in person: join the party via giant video screens around the country or sing along by telly, tablet, smartphone, laptop or radio, thanks to the BBC. Photo: Celebrating the Last Night of the BBC Proms, Proms in the Park. Photo copyright BBC - Mark Allan. Summertime is festival time in Britain, with over 400 fab fests happening across the UK each summer. From established big beasts like Glastonbury, Glyndebourne and the Edinburgh Festival and uber-cool newbies like Love Supreme Jazz and Greenwich Music Time, to weirder wonders like Bloodstock, New Forest Fairy Festival and Supernormal, there’s a festival for every age, taste and fetish. Top of our family friendly favourites and the perfect excuse for a weekend away in the lovely Cotswolds is the Cornbury Festival. Variously described as a country fair with a rock and roll twist, a very English open air party and a farmers’ market with a dancefloor, Cornbury offers a chilled mix of pop, rock, blues and plenty of music that cannot be pigeonholed. You’ll also enjoy the fabulous Comedy Emporium, dedicated children’s areas, tempting choice of edibles and drinkables, posh loos and the joy known as ‘Glamping’— luxurious camping in yurts, tipis and podpads. Cornbury 2015 welcomes lilting legends Sir Tom Jones and Lulu, indie rockers the Fratellis and Razorlight, vintage Motown from Martha Reeves and the Vandellas and homegrown alt- country heartthrobs, The Shires. 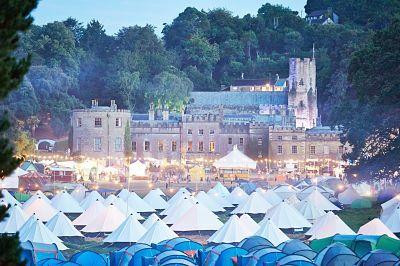 For another great family option head to Cornwall and the fairytale setting of Port Eliot Festival, a uniquely creative and laid back festival of words, music, fashion, flowers and extremely good food. Flower and Fodder is the festival’s phenomenal food and garden area, where top culinary and garden geniuses give talks and demos. The Bowling Green, Park and Caught by the River host authors, musicians and comedians, and the Wardrobe Department takes imaginative fashion full on. You can sample workshops in wild brewing, kotlich cooking, botanical illustrating and knicker making, and the festival has tons of events for families such as wild swimming, spooky nighttime walks, a woodland summer ball and a Pirate School. Port Eliot itself is a beautiful, historic stately home and former medieval monastery, packed with atmosphere and treasures. Camp Bestival also prides itself on a particularly family festival focus. It takes place on the grounds of ancient Lulworth Castle, Dorset, with its backdrop of stunning coastal scenery. This year, Camp Bestival’s Go Wild theme summons“wild boys and wild girls to the wildest place on earth”. Expect first rate music over multiple stages including Kaiser Chiefs, Alison Moyet, Ella Eyre, Buzzcocks and the Spooky Men’s Chorale plus a massive mix of comedy, dance and theatre. The Den is a festival within a festival, exclusively for teenagers. But above all are kids activities galore and plenty of chances for the whole family to release its inner beast, with bushcraft, foraging walks, stargazing, cooking in mud kitchens, campfires, tub bathing under the sky, mass sleep-outs and other natural pleasures. Don’t miss festival favourites like Insect Circus, Igor Rasputin’s Caravan of Lost Souls and Gorilla Gardening, and there’s even rumours of the Gruffalo making an appearance. You can’t travel far in Scotland without seeing a golf course. There are 550 so far – and counting. New courses are being constructed, often close to existing ones. Many of the famous big- name courses offer a wide variety of facilities. In addition to top-rate accommodation and dining there are swimming pools, spas and athletic training rooms. The variety of Scotland’s landscape, especially its extensive sea coast, creates exciting playing conditions and stunning panoramic views. But if you have a love for exploration many of the smaller courses come up with delightful surprises. One of our prettiest local courses is set between the Fife Coastal Path and the broad waters of the Firth of Forth at Aberdour, one of the string of picturesque old fishing villages along the south coast of Fife. The panoramic view across the Firth of Forth takes in the Forth Bridges to the west, the island of Inchcolm with its tiny ruined abbey, to the City of Edinburgh and Holyrood Palace on the far shore, protected by the heights and crags of Arthur’s Seat to the east. If you can take your eyes off the views, which change with every shot, you will find the course a testing one. Our local club in Dunfermline has a winding approach road that leads through the course to the imposing cream-rendered castle-mansion of Pitfirrane House, previously the home of the Halketts (pronounced Hakkett) from the 16th century. Up a wide stone spiral staircase is the dining room with magnificent wood panelling and a painted ceiling decorated with the family’s coat of arms, and crest, a hawk – the Halkett family were Royal Hawkers to King James I/VI. The Dunfermline Golf Club also has the distinction of introducing the game ‘across the pond’ in 1888 when two of its members, John Reid and Robert Lockhart, set out a short course of three holes in an apple orchard in Yonkers, New York. Initially known as the “Apple Tree Gang”, it was formally organised in the same year and named, ”St. Andrew’s” (with an apostrophe) as a tribute to the cradle of the game in Scotland. The historic university town of St. Andrews, at the eastern end of the“Kingdom of Fife”, is a delightful setting for the world-famous St Andrews Royal and Ancient Golf Club, which is acknowledged as the birthplace of the game as it is played today, and boasts the first Ladies’ golf club in the world in 1867. Regarding the ‘Ancient’ in the title, there is documentary evidence from1552 confirming that golf, as well as other games, was played on the links at that time, but it was not until 1754 that a club was formed. The ‘Royal’ title was added in 1836 when King William IV became Patron, and six members of the royal family have since captained the Club. In 1863, the Prince of Wales, later King Edward VII, was the first Royal Captain, followed in 1876 by his brother Prince Leopold. King Edward VIII was an ardent golfer and in 1922 became Captain of the Club, being followed by his brother, later King George VI. In 1937, the Duke of Kent became Captain and was followed in 2004 by Prince Andrew, the present Duke of Kent. The almost legendry ‘Old Tom Morris’ laid out the original course, and many others too. St Andrews boasts eight courses including the famous ‘Old Course’, right in front of the imposing Club House. Right now they are gearing up for the Open Championship taking place from 16-19th July this year.The British Golf Museum, just across the road, has been totally refurbished in time for this important event. Moving north, across the River Tay and to the east of Dundee, is the famous Carnoustie Golf Club, constituted in 1842. Members of Carnoustie are proud of having helped to develop golf in fourteen countries around the world. Like so many Scottish courses, it is sited right on the coast. In fine weather the views are inspiring, although there are times when the weather off the North Sea is ‘challenging’, but that brings out a real golfers’ skill! Further to the north, past Aberdeen, is the much publicised Trump Golf Links, also right on the North Sea Coast, and offering a testing course through the sand dunes. Another Trump enterprise is the famous Turnberry Club on Scotland’s south-west coast in Ayrshire. This resort complex is situated next to an old lighthouse on the Forth of Clyde, with a stunning vista across the sea to Ailsa Craig, the Isle of Arran and the Mull of Kintyre – as well as the coast of Northern Ireland, on a good day. In Central Scotland, between Stirling and Perth, there is a scenic way through the Ochil Hills called “Glen Eagles”. Way back in 1910, the General Manager of the Caledonian Railway Company was so impressed by the site that he decided to build a Grand Hotel where his“rail guests will travel on our trains, stay in our hotel, to play golf on our courses.”While the Hotel was being built, the great James Braid designed and built the King’s and Queen’s Courses utilising the natural complexities of the ground to make a fascinating challenge for the players. The First World War delayed completion but both courses were opened in 1919 and Gleneagles flourished until 1939 when the hotel became a military hospital. Since the end of World War II major changes have taken place, and Gleneagles, was the venue for the Ryder Cup in 2014. The PGA Golf Academy is now established at Gleneagles, and the addition of a top-ranking restaurant, conference facilities and a luxurious spa have expanded the hotel’s appeal, but it is the range of sporting and other leisure activities that is mind-boggling: equestrian school, falconry, fishing, shooting and gun-dog school, archery, wildlife photography, cycling, off-road driving, and even indoor tennis! As I see it, this is only the surface. What lies beneath this emotional roller coaster? Adaptation consists of digesting all of that. On the way, we are led to put our whole lives into perspective, question what we know and assume, and learn new ways of functioning to attempt to understand another culture and ourselves within it. Culture shock strips us from our comforts straight down to our core, puts us eye to eye with our basic needs, and propels us into a moment of accelerated growth. We slowly begin to make sense of all the new sights, sounds, smells, tastes and textures. We learn about this place we didn’t know before, about people’s lives and we attempt to understand our relation to both. So, in its essence, the experience of culture shock is a profound shift in consciousness. How does that shift take place? Often our ideas and the reality we find don’t match. There is a dissonance on multiple levels that can feel threatening because some of our basic assumptions and abilities might be challenged. What do I eat? Where do I sleep? Who do I connect with? Where do I belong? Will it be safe? We question our abilities to meet some of our basic needs. Then of course we also wonder about our new surroundings: What is there to see? What are the stories behind it? How do they reflect local beliefs? What do people think? What do I think? The list is endless. To get through culture shock, we need to reconcile the information we’re getting with our own reactions, thoughts (in the shape of ideas, preconceived notions, expectations, hopes, cultural background) and personal needs, and adapt our thoughts and reactions to that information as well. We need to let go of preconceived notions to make room for reality. • See our own roots and culture with different eyes ...and so on. It is a raw but exhilarating experience. One of the wonderful things about culture shock is that it brings us back to basics. It is a reminder of what’s essential. Of course, the essential is sometimes clouded by our perception of everything surrounding it. So when it feels like we suddenly don’t control anything, everything around us simply happens and we’re not quite sure how to manage, it’s important to realise what we can control - our own behaviour and attitude. Through both we can learn to meet material and emotional needs at a time when meeting those needs is not a given and we don’t necessarily have many resources to do so. In this sense, simple actions also have a deeper effect beyond the immediate relief they may bring. They help us tune into our core, handle change, connect across cultures and become aware of others and ourselves. In the end, culture shock is about growth. It teaches us compassion, kindness and gratitude. So what matters is what we learn and how we act and change as a result of that experience. But we can only grow and learn if we take responsibility for our experiences, reactions, perceptions, behaviour, thinking, beliefs and interactions. Experiencing culture shock then becomes a gift that helps us find our story within a world of stories and understand how all are connected. The term ‘culture shock’ often evokes negative connotations. Using the excerpt above, ask yourself the following question: How have challenging cultural transitions positively impacted my life? Food can give you a tasty insight into another country’s culinary traditions. Food is also a source of comfort. It’s a great way to learn about a new country and connect with people over something that we share: the need for food. A great icebreaker for sure! Please, thank you and a smile go a long way. Learn some basic phrases to get you started. Bring a small phrase book, pocket dictionary or app, depending on where you go and what kind of trip it is. While this may not lead to an in depth conversation about political or social issues, it gives you a place to start. Communicate not only to express your needs but also to ask questions and learn something. Remember that most communication is non verbal, so don’t be afraid to use your hands and feet - that’s always fun no matter how clumsy it might feel! Don’t just stick to words. Find out about body language. What’s the polite way to hail a cab? Beckon someone to come over? Is it rude or polite to look someone directly in the eyes? Observe. This is an opportunity to slow down and take it easy. Take your time to adapt. Let go of any preconceptions you might have. Leave stress and pressure behind. Don’t force yourself to visit as many sights as you can - even if you think you should. The point is to enjoy yourself, isn’t it? Make a choice and then relax. This is a great time to get to know yourself a little better by observing your reactions and understanding your needs in a challenging situation. Allow yourself time to fully experience this transition. Mostly, though, I’m grateful for the kindness of strangers, conversations I had with people I met along the way, friends I made, lessons I learned and the privilege of having had the opportunity to experience all this in the first place. H.E. Rybol is an Adult Third Culture Kid, which means that her parents have two different nationalities (German/ French) and she grew up in a third country (Luxembourg). She has a BA in English (USA) and an MA in Interpreting, Translation and Diplomacy (England). She has spent her life living, working, studying and travelling around the world. When I initially suggested to my two children (16 year old son and 13 year old daughter) that I would like to take them to London to visit all the sites, I expected the usual teenager response of ‘do I have to?’, but to my surprise, and frankly amazement, they both seemed really keen. 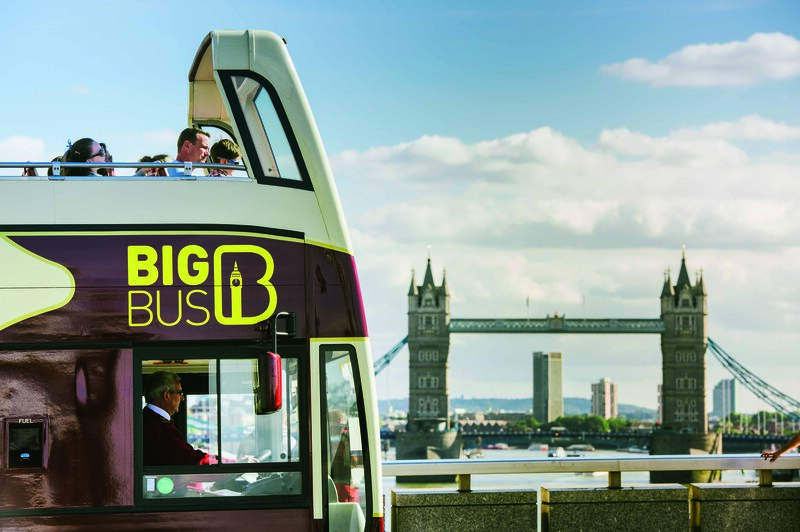 Our proposed carrier through the London sites was the Big Bus Tours who were formed in 2011 from the merger of two companies each with over 20 years of successful tour experience and who offer open top sightseeing tours across 3 continents and 17 cities. This experience was evident as it tackled the near impossible task of catering for everyone from the first time visitor to the seasoned veteran, both children and adults with aplomb, as the information was both current and historical and even the most seasoned of you will learn new facts. What is also nice is the routes are well thought out and not only cover all the well known sites, but visit some of the lesser known areas where it is great to spot those quirks which I believe make London the best city in the world to live. These include hidden churches dwarfed by modern buildings, the hidden gardens only visible from the upper deck, and the quirky alleyways or mews. What is clear is that the buses are regular and give fantastic views, and if the weather is fine, which it was when we went, you also get a tan whilst being educated, and we all loved it. There are two routes to choose from, the classic Red Tour which has live English commentary which wends its circular route from Green Park tube via Tower Bridge and Trafalgar Square to Victoria station, and the Big Blue tour which has an audio commentary in a choice of 12 languages and does a similar route but also takes in Westminster Abbey. The thing I loved the most is the fact that when you reach somewhere you want to investigate further you just hop off the bus and when you are done there is always another bus on its way for you to continue your journey. The highlight for my daughter was the free boat cruise which you get with your ticket which takes you from The Tower of London to Westminster pier or vice versa. The waterway is underused, but this isn’t just a shuttle, it is a tour, and what made it for my daughter was the commentary which struck the perfect balance between providing information and being slightly more irreverent. There was so much to do we couldn’t fit everything into one day (which is why you get a second day free with your ticket), so although we missed the first walking tour taking you to see the changing of the guard, we did manage the ‘Scene in London’tour which lasts approximately 2 hours, where we visited film locations for many films including Harry Potter. Did you know that the setting for Gringotts Bank is, in fact, the Australian High Commission for example? I do now! After almost 6 hours of sightseeing we had to admit defeat before the Haunting Mysteries Tour, but we had had a marvellous time and learnt something in the bargain. As we returned home on the train I asked my chidren what their favourite thing was, and my son delightfully came up with the fact that he wished he had been around in the 18th Century so he could have seen the hangings at Tyburn which is now the site of Marble Arch, and although a little gruesome, at least he had come away with more knowledge of London than when he arrived. The Big Bus Adult ticket costs from £27.99 for the day tour (2nd day free), £12.99 for Children, or from £72.99 for a family ticket that includes the cruise, all walks and also a reward voucher book for a number of the sites, and when you consider the cost of a travelcard in London these days, is excellent value and has something for all the family, even a Londoner for over 20 years.